Fatih is the central district of the historical İstanbul, covering almost all of the area inside the historical city walls, where İstanbul was first founded and developed in time. Fatih is the central district of the historical İstanbul, covering almost all of the area inside the historical city walls, where İstanbul was first founded and developed in time. It is surrounded by Eyüp on the northwest, Zeytinburnu on the southwest, Golden Horn on the north, Bosphorus on the east and Marmara Sea on the south. Between 1928 and 2008, the historical peninsula hosted the municipalities of faith and Eminönü together. Since the municipality of Eminönü was dissolved and included in Fatih in 2008, the district has become the only administrative body on the historical peninsula. 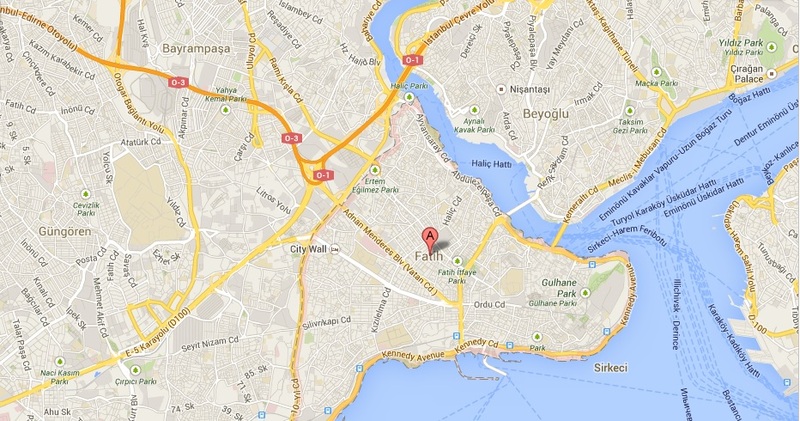 Fatih extends on a land of 15.62 km² without any rural settlements and has 57 neighborhood quarters. The Greek Patriarchate used to be next to Hagia Sophia when the city was conquered by the Ottomans. It was transferred to the Church of Apostles first and then to Fener district. Mehmed the Conqueror ordered the demolition of the Church of the Apostles on the tenth year of the conquest and had a complex built in his name. A Muslim settlement started to grow up around the Fatih Complex. Afterwards, the neighborhood was named after the complex and rapidly expanded to become a classical Ottoman-Turkish urban settlement. During the excavation works for the Marmaray tunnel project, it was discovered that the history of the surrounding area dates back to 8500 years ago and Fatih is quite rich in historical buildings and structures. The historical peninsula served as one of the most important centers of the Roman Empire and it was used as the capital ofand Ottoman Empire for 1058 and 469 years respectively. Hence, it is possible to observe the significant works by three different civilizations in the peninsula. The historical peninsula is almost an open air museum as a whole in this respect. Fatih also hosts many structures under restoration as well as the ones that are already open for visiting. These are the walls surrounding İstanbul that were built during the Byzantine Empire period of the city. The construction of the walls started in the 5th century AD and restored many times after the earthquakes, demolitions and the effects of time. The walls extended from the Sarayburnu area to Ayvansaray on the Golden Horn coast; to Yedikule on the Marmara Sea coast, and from Yedikule to Topkapı, Topkapı to Ayvansaray circling the city during the reign of Theodosius II (408-450 AD). Today only the northern and western parts of the walls are preserved. The line between Ayvansaray on the Golden Horn coast and Yedikule on the Marmara Sea coast has been repaired and they serve as the boundary between Fatih on the one side and on the other side Eyüp and Zeytinburnu. The seaside walls haven’t survived in the coasts since they were heavily damaged during the long history of the city. It is a patriarchal cathedral with a basilica plan, built on the oldest city center in the historical peninsula between 532 and 537 AD on the order of Byzantine Emperor Justinian I. Upon the conquest of İstanbul by Mehmed II, the cathedral was converted to a mosque and it is used as a museum today. Hagia Sophia is considered a successful combination of the basilica plan and the domed central plan and it is seen as a turning point in the history of architecture with its dome transitions and the uniqueness of its supporting systems. The Palace was built on the order of Mehmed the Conqueror in 1478 and it was used as the administrative center of the Ottoman Empire and the residing place of the sultans for almost 380 years until Abdülmecit had Dolmabahçe Palace built. It stretched on an area of 700.000 m² when it was first built, but today the total area of the palace is 80.000 m². Thousands of domestic and international tourists visit Topkapı Palace every day and it is considered as one of the most popular historical sights in İstanbul. Commissioned by Sutan Ahmet I and built by the architect Sedefkar Mehmet Ağa between 1609 and 1616, Sultan Ahmet Mosque is also called the “Blue Mosque” by foreigners because of the rich İznik tiles that are used to decorated the interior of the mosque and also the mostly blue ornaments on the interiors of the dome and the half domes. After Hagia Sophia was converted to a museum in 1934, Sultanahmet Mosque became the central mosque in İstanbu. Actually it constitutes one of the largest building complexes in İstanbul when taken together with the surrounding elements. The complex consists of the mosque, madrasas, the Imperial Pavilion, arasta bazaar, shops, bath, fountains, a shrine, darüşşifa (hospital), sıbyan mektebi (elementary school), imarethane (soup kitchen) and other rooms for rent. Unfortunately some of these structures haven’t survived to our day. The bazaar is behind the New Mosque (Yeni Cami) and next to the Flower Market (Çiçek Pazarı). One of the oldest indoors bazaars of İstanbul, Spice Bazaar was commissioned by Turhan Sultan in 1660. The architect was Kazım Agha. It was most recently restored between 1940 and 1943 by the Municipality of Istanbul. It is the largest Byzantine church in İstanbul. According to the historical sources, it was built in the early 4th century AD during the reign of Constantinus I (324-337 AD) using some of the materials of the ancient Artemis, Aphrodite and Apollo temples that used to be on the site. Sharing the same courtyard with Hagia Sophia, Hagia Irene was burnt during the Nika Revolt in 532, together with Sempson Zenon building next to it. The first museum concept in Turkey was initiated in Hagia Irene. Many artifacts collected from different regions under the Ottoman rule were displayed in Hagia Irene under the categories of Mecma-i Esliha-i Atika (Weapons Collection) and Mecma-i Asar-ı Atika (Artifacts Collection). This museum was transferred to the Çinili Köşk (The Tiled Kiosk) in 1875. Several historical items were again collected in Hagia Irene for a planned military museum in 1908 and the place served as a military museum until 1949. The church was restored between 1974 and 1976, and the soil embankment around the structure was removed in order to prevent humidity. Since 1973, the church building has been serving as a center of cultural events mainly organized by İKSV (İstanbul Foundation for Culture and Arts). Also called Surp Asvadzadzin, this church is an Armenian Gregorian church located on Şarapnel Street in Kumkapı. It belongs to the Istanbul Armenian Patriarchate and stands opposite the Patriarchate. The exact foundation date is unknown. The church has undergone several fires I its history and it was renovated in 1902 and 1985. It also hosts a school. This is the train station that was built on the European side of İstanbul during the reign of Abdülhamit II. It is one of the two main stations of TCDD (Turkish State Railways) together with Haydarpaşa Train Station. There used to be small and temporary station on the site before. The current station’s plan was made by the German architect August Jachmund and in the construction granite marbles and stones imported from Marseille. The construction started on 11 February 1888 and was completed in 1890. It was opened by Ahmet Muhtar Pasha on behalf of Abdülhamid II. There are two clock towers on the façade of the station. The opening date of the station is inscribed on one of the lateral façades according to both Julian calendar and Gregorian calendar. The station used to be very close to the sea when it was first built, but its environment has changed dramatically in time. The restaurant in the station used to be frequented by famous writers, journalists and artists during the 1950s and 1960s. The Orient Express used to terminate its journey here from Paris for many years.